My favorite dessert in the world is ice cream. I really only like Vanilla Ice Cream though. My absolute favorite is to get Magic Shell and put it all over the vanilla ice cream. 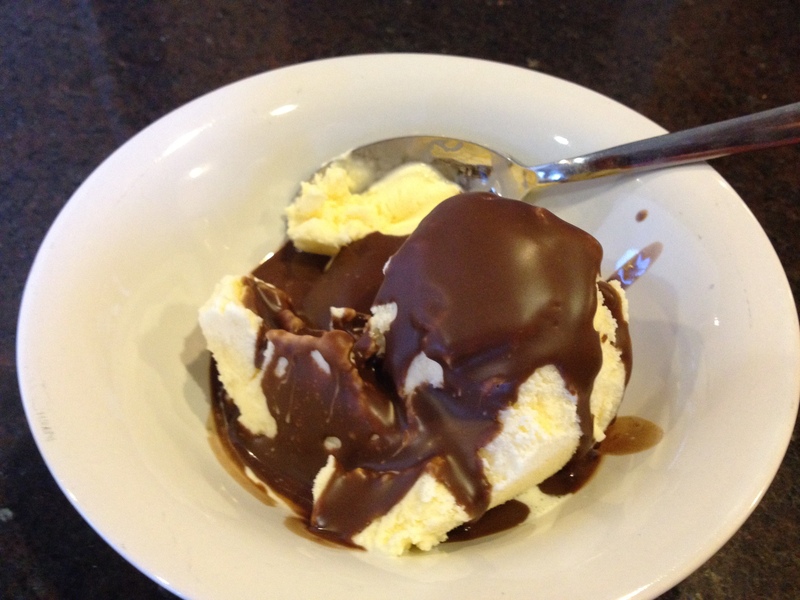 The chocolate forms a shell on the ice cream and it makes for a perfect dessert! It kind of reminds me of going to Dairy Queen when I was a little kid and getting a Dilly bar or a dipped ice cream cone! When I was younger, a really big treat was to go to Steve’s Ice Cream in Highland Park in the Dallas area. They mixed home-made ice cream with different candies. My favorite was to mix Heath Bar in to my ice cream. It was really exciting when they opened in Casa Linda and we were able to go all the time and not just for a special occasion! Today, I can go to Amy’s Ice Cream in Austin for this same treat. Some of the workers at Amy’s will even do tricks while they make your mixed in ice cream. Now that I’m older, I’m always trying to watch what I eat so I try not to eat too much ice cream. I’ve found that some of the yogurt shops have good mix in specials as a slightly healthier option. There is a really cool yogurt place in Casa Linda in Dallas called Monster Yogurt that has all kinds of mix ins that you can add in yourself. You pay for your yogurt by the weight of it. I’m sure they have some like that in Austin too. I’ll have to be on the look out!! Hi, i have a recipe for homemade magic shell on my blog, ’cause i love it, too!